Henry Diltz & Sweet Baby James. There comes a time in your teenage years when image is everything. You’re searching for someone to emulate – you’re looking for a hero. Your parents aren’t heroic anymore – quite the contrary — so you’re spending a lot of time alone in your bedroom. When I was a teenager, in the early 70s, there was no computer in the bedroom, no cell phone, no Internet, no TV, no video games. What you had were your records. LPs. And those LPs came with big pictures on the cover, pictures you could scrutinize and obsess over for hours, while reading the lyrics and absorbing the music. And then there was JT. 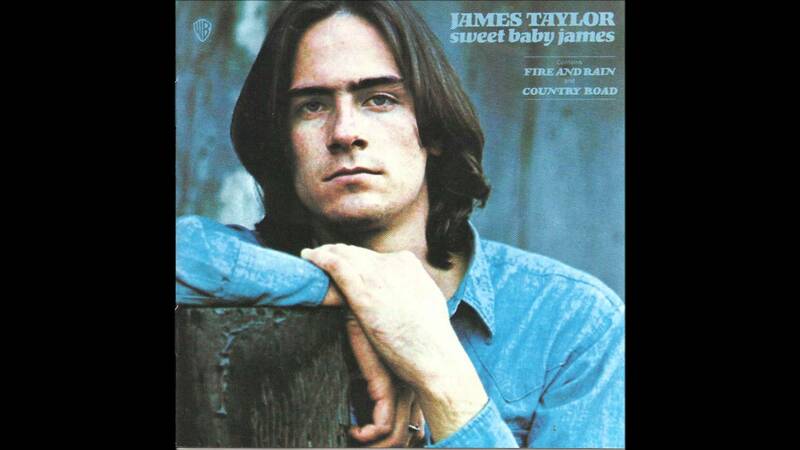 James Taylor. Sweet Baby James. And there was the blue-green hue of that iconic portrait taken by Henry Diltz. And inside the album, the lyrics were printed on a big double-spread, on the back of which was another beautiful portrait taken by Mr. Diltz. A portrait, like the cover shot, that showed James gazing gently at the photographer, not in some cold studio, but outside, in the natural splendor of nature, as natural as his earthy, captivating voice. At that time, the image of James, to me, was everything. He was a hero, and that picture captured all his shining heroic greatness. He was the essence of cool; cooler than any big brother, cooler than the coolest teacher or pro athlete. He was, like they said about Clark Gable in his day, the kind of man women swoon over, and men want to be. Not only was he tall and movie-star handsome, but he had a voice like the earth itself, a voice resplendent in its resonance. And he wrote songs that sounded like heaven. Songs of sadness – like “Fire and Rain,” songs of that natural splendor, like “Blossom” and “Anywhere Like Heaven,” songs that rocked with the blues, like “Steamroller Blues,” and songs that told mythic cowboy tales, like “Sweet Baby James.” To be a kid in the suburbs of Chicago and hear him sing about a “young cowboy who lives on the plains,” and whose “horse and cattle are his only companions,” was more beautiful and thrilling and soul-nourishing than anything we had before; it was more thrilling than “Twilight Zone,” than Ed Sullivan, than baseball, than the Marx Brothers, than Superman, Batman and the Green Lantern all combined. And it was all represented by those photos, taken by a guy whose name I knew well from all those years of scrutinizing album covers. Henry Diltz. The name to me became as mythic as the music it accompanied. A name I saw on the LPs of so many of the great heroes of that time. But this one – Sweet Baby James – will always resound in my life, because it intersected with my soul at that exact moment – that incredibly impressionable moment of awakening youth – when the whole world is just starting to unfold in all its beautiful, romantic and mysterious glory. It was a world in which, instead of becoming a businessman like most of our fathers, one could become a man like JT. A man who strode like Lincoln with a guitar. A man who hung out and romanced genuine goddesses, like Joni Mitchell and Carole King. Like so many people my age, I took that middle-spread Diltzian portrait of JT out of the album, and taped it up in my bedroom. Over my desk. So I could look into his eyes every day – in the morning when I got up, in the long after-school afternoon when I would make that happy leap directly into the heart of his music, and in the night, when I’d go to sleep. I’d look into those eyes that were smiling – a confident, knowing smile –smiling precisely because they were looking into the lens of Henry Diltz. There was Henry, behind the photo, behind his camera, this magical and mysterious man of the famous name and even more famous photos, whose own face was always hidden, never revealed, only reflected in the beamish repose of those he photographed. This photo was cropped perfectly, so that all the emphasis of was on the face itself – that face of ambition, of preternatural wisdom – that face of romance, of possibility, of promise. It was all captured by the gifted Mr. Diltz, whose own face I imagined – way back then, many decades ago now – to be even older than it is now. I reasoned that anyone taking photos of that caliber, and hanging out with all these artists – these artists from California of all fantastic places, the exotic Golden State – these artists who painted our very lives with their powerfully intimate voices and songs and guitars – anyone who could do all that had to have been doing it a long time to reach this plateau of greatness. I assumed, wrongly, that Henry was an old guy. I figured he must be a very seasoned pro who had been around the music world for decades so as to be granted access to my heroes. For some reason I pictured him then not unlike the way he looks now – an old hippie. Not a young one, but still with a sparkle in his eyes and a pony-tail. But little did I know at the time that Henry was actually one of their peers. A musician himself. A denizen of that same Laurel Canyon from which so much of this special magic emanated. But, as I later discovered, it was because Henry himself possessed that very magic – he played music, he hung with goddesses, he laughed and partied alongside JT and Cros and all the coolest of the cool heroes – that he and he alone could translate that magic at this unique juncture in human history, at this farthest western edge of the continent, and he could embody in his photographs this unique, unprecedented fusion of Americana with poetry, myth, folk music, rock and roll, art, literature, drugs, electricity, budding awareness, blossoming enlightenment, audacious aspiration, rebellion, revolution, book smarts, street wisdom, spirituality, real romance, sexual fire, beauty, and euphoria, and he could do it in a way that was elegant, imbued with grace, and as timeless as those songs are timeless. I also assumed, wrongly, that the photo was taken in James’ native Massachusetts. I never thought about this aspect much, it’s just something I figured neatly into the equation. It was a bit of a revelation when, years later, Henry told me he actually shot it in Burbank! Over at what is now the Oakwood Apartments, where Zevon and others came to sometimes reside. Back then it was a farm with an old weathered barn that Henry loved to use for shoots. Henry Diltz, in his visual expedition into the heart of the music, preserved for all of us the magical genius of that time, the inspirational glory that was expressed in those classic songs, in the words and music of James Taylor and the rest. And though JT himself, and all of us, have aged, the music is untouched by time, the spirit perseveres, and those great photos by Henry Diltz remain; their power is undiminished by the crass commercialism of modern times. Those great photos remain great because it was a great time, and great artists were connected directly to the electric bloodstream of the people, and their music was our music, and their visionary hopes for a better world were our hopes, and their romance was our romance. And one man captured it all. And it turns out, remarkably, that he’s one of the sweetest humans ever. His name is Henry Diltz. Freakin’ fabulous…James Taylor’s songs, Henry Diltz’s photos and now, your descriptive writing…doesn’t get much better than this. Go Paul Go!